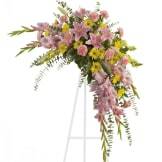 With a bounty of lovely pink flowers and simple greens, this pretty spray lets you express your sympathy beautifully. • Splendid pink, hot pink and light pink flowers such as alstroemeria, gladioli, carnations, asters and more create a display that is warm and loving. 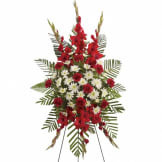 • Arrangement measures approximately 22" W X 31 1/2" H.
Flowers will be received by a Lenmark-Gomsrud-Linn Funeral & Cremation's staff. This spray was absolutely beautiful! It was so much better than the picture and we were all thrilled! The process of ordering this spray was seamless and easy. The price was within our church's guideline and looked appropriate for the young lady who was deceased. Her family appreciated it very much. 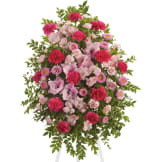 I did not see the actual spray as it was sent out of state, so I can not comment on the actual flowers or arrangements. The Sympathy Store kept me up to date via email about the order and delivery. I would definitely use this service again in the future. Lovely arrangement using fresh flowers and pretty substitution in center. Very pleased. The spray was beautiful except you placed my card on a purple one. I did not like the purple. I told the family of the mistake. The Pink Tribute was even more beautiful when it arrived than what it looked like in the picture. Worth the money and more! I am so very grateful for the staff at The Sympathy Store that assisted me with placing this order. The flowers were beautiful and arrived on time for the service. The spray was beautiful. We were all happy with the arrangement. the flowers were pretty. it was better than the picture. I was pleased with my purchase. The arrangement was fresh, vibrant, and better than the photo. All our Flamingo Friends were very pleased with our flowers for our dear friend, Marilyn. Thank you for your website. We were very pleased with the beautiful pink spray for my sister at her funeral yesterday. It was well worth the amount charged. This was a full, beautiful spray for a beautiful Aunt! We were very pleased! All of our flowers are designed and delivered by hand from a local florist in in Eau Claire.